American Woodmark was founded in 1980, creating wooden furniture and products for the home. Starting as a small company in Virginia they’ve spread across the country and now have 14 different manufacturing sites in multiple states. In it’s 37 year history it’s transformed into a well-known brand that is featuring in homes across America providing innovative storage solutions. Because of this, I have decided to make this American Woodmark Cabinet Reviews guide! American Woodmark are passionate about combining comfort, style and function to create something unique for your home and they strive to make every unit true to these core values. They believe in green manufacturing and reducing their carbon footprint as well as sustainable furniture that does not over exploit the forests. American Woodmark are an all American manufacturer with the process kept in the U.S and its high production values are the heart of the company. American Woodmark create furniture and storage solutions for the whole home. Their products create inventive solutions for storage within the home that allow customers to use their space efficiently. 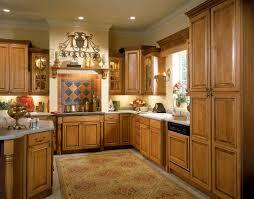 They have ranges for bathrooms and offices but the backbone of their range is their kitchen cabinetry. These custom units are created specifically for the customer to suit the particular needs of the home. Home Depot have a close relationship with American Woodmark and they are the biggest sellers of their cabinets. Other Home Depot sponsored cabinets include Thomasville cabinets and Kraftmaid cabinets. 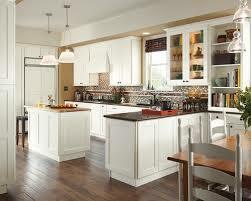 American Woodmark kitchen cabinets are available in two different types; standard or plywood. The plywood provides a more durable quality that won’t wear as easily. All of these innovative features go into the high quality woodmark cabinetry and they’re always working on more. Along with this, they have more than 12 different collections to choose from and a website detailing them all if you're browsing online. If you need more variation then Cliqstudios has a lot of collections! Along with these different styles there is a choice of wood and over 35 different finishes, ranging from Maple to Silk. Woodmark certainly showcase their quality and choice well. There are many options to choose from which give a premium feel to your kitchen cabinets​. One of American Woodmark’s most unique features is it’s impressive planning tool. You can use it to effectively navigate their wide selection and find what’s right for you. It’s a fantastic tool for home planners and I encourage you to check it out. Other companies that have similar planning tools are Diamond cabinets and Schrock cabinets. American Woodmark do all of their manufacturing within the country and are a part of the Kitchen Cabinet Manufacturing Association (KCMA). The KCMA has rigorous strength, quality and performance standards that American Woodmark cabinetry stands up to, showing the quality of their products. American Woodmark set themselves apart with their impressive face frame construction. This frame is crafted from solid hardwood before being dried in a kiln to prevent warping. The joints of the face frame are pressure fitted and glued to increase the adhesion. Then the frame is double dowelled, and stapled. This process creates a secure and durable unit that is able to stand the test of time. This commitment to quality creates a unique unit with great value to the buyer. "​I have been extremely pleased with the quality, workmanship, service, but most importantly the durability, and I have 11 years of use to prove it!" - David K.
Another great feature of American Woodmark furniture is the beautyguard finish. This involves sanding, brushing, cleaning, and catalyzing a topcoat that will protect your cabinet from water damage. This finish also makes cleaning the cabinets simple. The beautyguard finish makes the American Woodmark cabinetry an even greater asset to the home. 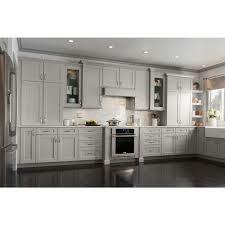 If you are looking for other cabinets with great finishes check out Bellmont cabinets and Wellborn cabinets. American Woodmark offer a lifetime guarantee on their products against any defects in materials or workmanship. This lasts as long as you own the home they are fitted in. This solid warranty adds a level of reliability to the American Woodmark products. After doing our reviews, and finding other peoples experiences online, we found that there are tons of positive reviews online for American Woodmark cabinets. When I received the cabinets, they were all packaged quite well (as in lots of padding where needed), and I did not have any problems with any of the pieces when received. No damage, no missing pieces, and all the cabinets were of pretty good quality. Overall the installation went good, and my cabinets are still in great shape 7 years later. I'd recommend American Woodmark. 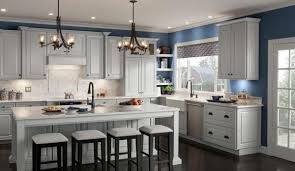 The style and designs of the cabinets impress people and the majority of customers seem really pleased with their purchase. Along with this the durability and material seems to be of pretty good quality because the majority of the reviews state that they have had the cabinets for years and they still are in good shape. Although there are mostly positives to this company, we did find a few complaints. One of the main complaints had to do with finishing issues on some of the lower end models. "​A large majority of the joints were showing on one of our cabinet doors, and there was a chip in the finish." 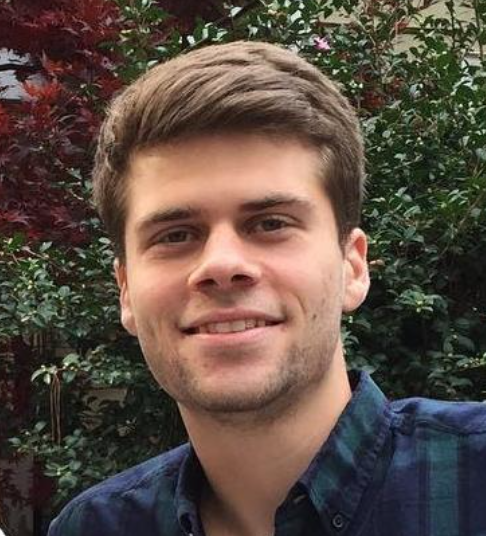 - Daveed L.
This occasionally happens with some of the cheaper ranges and is very disappointing to the customer. The best thing to do is upgrade to plywood wherever your budget allows as their gives a more even wood that is easier to paint and finish​. There are also some complaints over customer service but these are more the fault of the dealer (Home Depot) than the manufacturer. Be vigilant when units are being installed and check for any defects and allow some time for replacements which can take a while to arrive. American Woodmark is a mid range cabinet supplier which a more affordable option than some of it’s closest competitors like Thomasville and Kraftmaid. It offers a lot of modern features and the planner really helps you style out your kitchen. The cabinetry is functional,stylish and if you can afford the plywood option it’s certainly durable. A solid warranty backs up the manufacturing process and American Woodmark is certainly a good option if you’re looking to kit out your kitchen effectively. Overall I hope you enjoyed my American Woodmark Cabinet Reviews guide, and you found it helpful!